On the Sixth Sunday of Easter, 1 May 2016, 1050 years of Christianity in Poland were celebrated with Mass at Ealing Abbey. Cardinal Vincent was the principal celebrant at this joyful and proud occasion for Polish people. During this year, the baptism of Mieszko I, the first ruler of the Polish State, in 966, is marked. In his homily Cardinal Vincent noted that 50 years ago 'would not have been a good time for such celebrations' and that 'they had caused considerable conflict'. He prayed that 'the Catholic faith may continue to inspire' Poland and that 'the strength, generosity and sense of sacrifice which springs from the very heart of this faith may long be a fundamental part of your national characteristics'. He also noted the contribution that Polish people have made and continue to make to this country. Referring to Pope Francis' Apostolic Exhortation about the 'importance of family and the love at the heart of family life', the Cardinal spoke of the day's celebrations as an example of how Polish people are responding to the Pope's call to make their 'families places where children can sink roots in the rich soil' of their collective history. Noting the difficulties that can exist in family life, Cardinal Vincent echoed the Pope's call to ' the whole Church to go out to find those who are struggling and make sure that they have the support they truly need'. He went on to say: 'This is the work that we all need to do to create the circumstances in which recourse to abortion is recognised for what it is: the destruction of an innocent human life and a tragic intervention into a woman’s life. He concluded by praying for 'Poland and all its families', asking God's blessings. 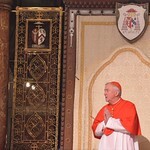 The full text of the Cardinal's homily can be found here.